Main Attractions: Tall hardwood forest, bird watching, nice scenic pond, bogs, old stone walls/artifacts. Basset Loop Trail located within Gerarld Ivers Nature, Southbury, CT is a hidden treasure amongst suburban neighborhoods. It's not likely many people excepts locals know about it and although there aren't amazing overviews, cascading waterfalls, or other significant landmarks, it's still a great place to check out. Tall trees, streams, boggy areas, and a scenic pond create a nice "get away from it all" feeling. Sharp eyes and quiet feet will reveal woodpeckers, owls, hawks, songbirds, toad, frogs, turtles, and a wide range of insects, plants, and other natural wonders. Basset Loop along with it's twin trail, Ivers Loop, seems like your typical tall hardwood forest trail but if you're smart you'll take your time through here and notice the smaller worlds where a lot of activity is on going. 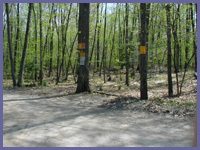 Basset Loop can be accessed via 3 different trailheads. The easiest is via Spur Trail, a short path, which starts off a dirt road and makes it's way to Basset. (At the other end of the nature preserve is Ivers Loop which is another option for getting to Basset Loop. However this should only be attempted by those in reasonably good shape and not put off by a couple of hours of hiking. The third option is considered the official trailhead accessed via a cul-de-sac road south of the Spur Trail entrance...Berkshire Hiking can't give driving direction here because of lack of knowledge about the road.) When you meet up with Basset Loop you can go left or right and it doesn't matter which way since it's a loop. However, if 2.5 miles seems like a lot and you're worried about going too far, just take the trail to the left. This will take you through some nice hardwood forest terrain and eventually to a nice, serene pond landscape. This is a good place to rest and grab a snack (hot, muggy summer weather especially dawn or dusk will bring out the mosquitos so bring bug spray). Along the way to the pond you'll notice old stone fences and even an old truck (pictured above in the main photo). 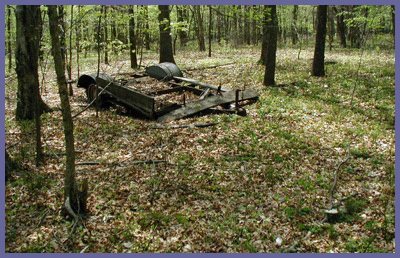 Years ago this was old open farmland and pastures and the artifacts are the only remaining hints that the forest was once a field. Notice a handful of massive trees mixed in with the tall hardwoods. It's likey at one time they were the only trees standing in open fields. Click here if you're interested in getting a guided hike in this region. Directions: Take I-84 to Newtown exit 10. If you were traveling east from Danbury area take a right at the end of the winding ramp (Diner and gas stations will be to your left..don't go that way if confused). If you were traveling west from Waterbury area take a left at the end of the ramp. Follow this road down until you reach a small village area with small shops/stores. Take a left at traffic light onto Glen Rd. Follow this road all the way down until you reach the old iron bridge. At the end of the bridge take a sharp left onto River Rd. River Rd. winds along the Housatonic for a couples of mile. As you reach the power plant/large satellite dishes take the right turn just before called Purchase Brook Road. A couple miles up Purchase you'll come to a stop sign with fork in the road. Go left following Purchase Brook Road (do not go straight onto Stillson Road). About a 1/2 mile up Purchase is a left hand turn onto West Purchase Road. DO NOT take West Purchase Rd. instead use this as a marker and begin to slow down because about a 1/4 to 1/2 mile up the road from here is a dirt road called Gilbert Road on the left hand side. It's hard to notice so if you're driving to fast you'll go right passed it. Follow Gilbert Road about a 1/2 mile and on left side notice the trailhead signs for Spur Trail and/or Basset Loop.